KIMBER series, dedicated to the 9/11/01 terror attacks on America. As you might understand, WTC stands for "World Trade Center". The story so far: When the tragic events of 9/11 happened in NY, the ONLY things that were recovered completely intact from the United States Customs Service store placed UNDER the WTC were 100 Kimber pistols, in ALL their versions (Full-Size, Compact, Sub-Compact), which had to be shipped in Italy for the civilian market. KIMBER recovered the guns, re-arsenaled them, and finally shipped them to their final destination, thus giving life to the highest-priced 1911 cache you'll ever see... oh, sorry, you'll ever NOT see, KIMBER WTC is for Italy only! The factory did a pretty nice job, re-finishing the guns without changing their characteristics. 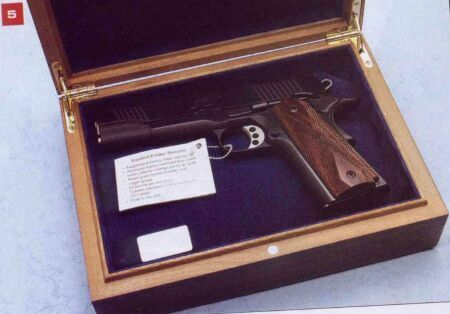 The guns are shipped in a "Macassar" mahogany box, with blue velvet inside it. ON the box there is a fine silver plate, with a drawing of the WTC towers and the words "9/11 --- We will never forget". INSIDE the box, a smaller silver plate reports the words "WTC 9/11" and the modelname and serial number of every gun. The wooden boxes with the guns inside will be delivered by themselves INSIDE their "original" plastic boxes, most of them still, and ,irretrievably dirty with the cement of the Towers That Fell Down; IN THIS WAY them will be sold to the customers, without any attempt to re-clean them. Actually, only ONE of those gun will remain in the USA: the one that will be donated by the Italian Republic and Kimber Arms to the President of the United States, Mr. George Walker Bush. The series of 1000 "Kimber WTC" pistols is so composed: #18 "Kimber Stainless Target"; #10 "Kimber Classic Custom Target"; #16 "Kimber Classic Custom"; #6 "Kimber Custom Royal"; #10 "Kimber Custom Night Sights"; #10 "Kimber Stainless Night Sights"; #10 "Kimber Stainless"; #10 "Kimber Pro-CDP"; #10 "Kimber Ultra-CDP". The price of the KIMBER WTC pistols has not been decided yet; a percentage of the price, however, will be given by KIMBER to the "9/11 Victims' Relatives Fund". 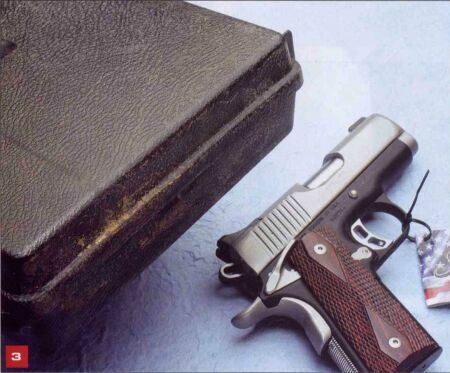 PICTURES DESCRIPTION: WTC-01: a KIMBER in its commemorative box WTC-02: The luxuous "Macassar wood" box and the commemorative plate WTC-03: One of the "original" plastic box, in which the customers will find the wooden boxes and the guns. Many of them still have on them the signs of cement due to the crumbe of the towers; no attempt was made to clean them, and none will be. 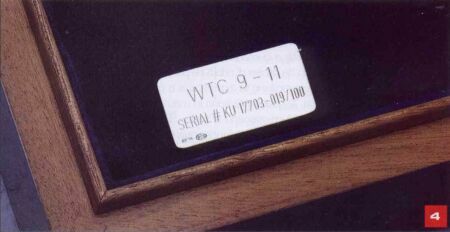 WTC-04: The plate from inside of one "Macassar Wood" box, with the serial number and the model of the gun on it. 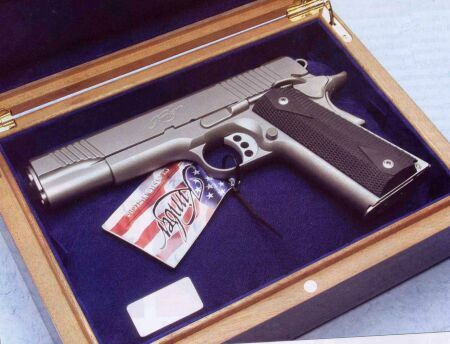 WTC-05: A "Kimber Custom Royal" WTC Series, as the one that will be donated to George W. Bush. WTC-06: Shooting proof with a KIMBER ULTRA-CDP, from 25 meters of distance. 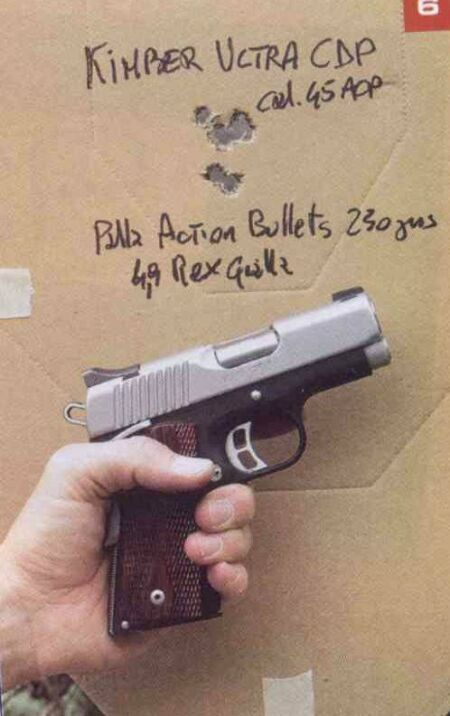 ALL the shooting proofs were operated using 230 Grains "Action" bullet, with loads of 4,9 grains of Yellow "Rex" powder. 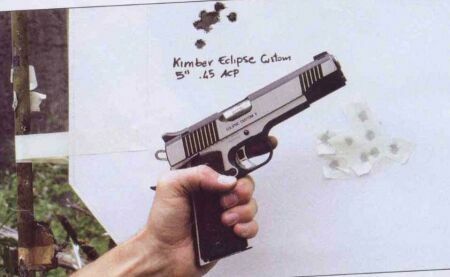 WTC-07: "Kimber Eclipse Custom" shot from 25 meters of distance. 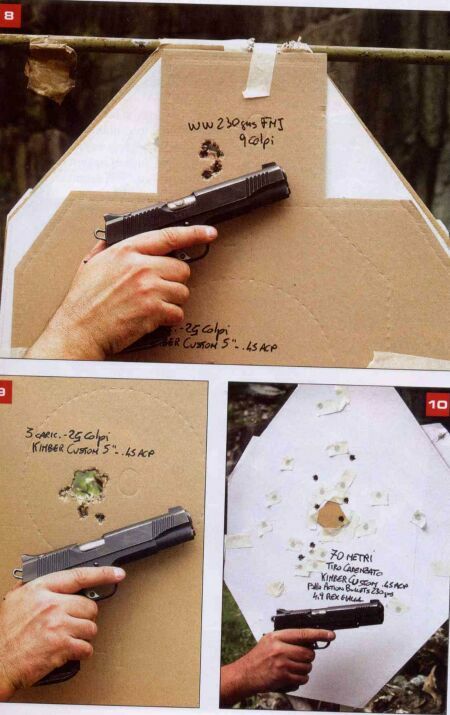 WTC-08: Three different shooting proofs. The first one (#8), from 25 meters with a "Kimber Custom"; the second one (#9) with the same gun but shooting 25 rounds in fast fire drom 15 meters of distance; the third one (#10), seven rounds fired with the same gun from 70 meters of distance... here the gun quality and the shooter's ability are not enough to achieve a good marksmanship.